Truck Tracker has a detailed Parts Inventory module that allows you to track detailed information on the on hand inventory cost, parts usage, suppliers and more. This module optimizes parts inventory levels while maintaining lowest possible inventory costs. It also assists in reducing stock surplus, obsolete parts in inventory, parts inventory shrinkage and increasing parts warranty recovery. Optimize reorder quantities using either a weighted average demand trend calculation or a standard min/max calculation. Track warranty provider, days and miles. Clean and dirty core tracking. Attach documents related to specific parts. Average or Actual costing methods available. Automatically generate purchase order for each vendor including parts that have reached reorder point in system. Ability to add parts that have been requisitioned for a work order to the purchase order. Ability to apply sales tax to entire purchase order or individual line items. Ability to track returned parts using credit items. Automatically update and close purchase order as parts are checked in. Systematically check in parts to inventory updating the on hand records and purchase order on order quantities. Track invoice reference numbers for all parts checked into inventory. Ability to check in entire purchase order with two mouse clicks. Automatically close out purchase order when all parts are received. Capability of receiving parts into inventory using bar code system. Print labels for parts using bar code printer. Permits parts to be checked out directly to vehicle/equipment without creating work order. Capable of checking out parts using bar code system. Generate parts usage history for each part. Track core credits received and update quantity of clean and dirty cores in inventory. 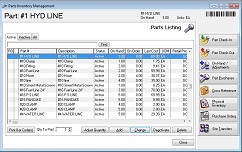 Maximum warranty detection using same part, cross-referenced parts or matching VMRS codes. Apply parts markup percentage for customer invoice. Use VMRS coding scheme to classify parts usage. 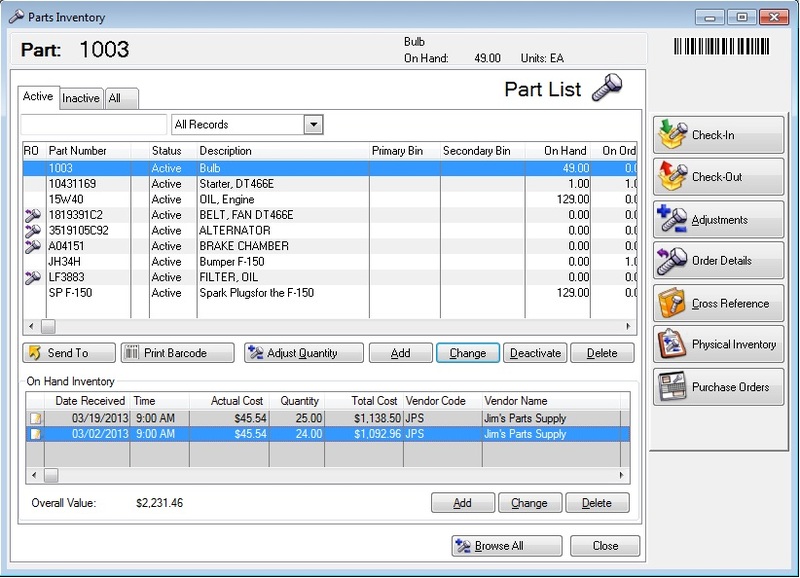 Automatically check out parts to a work order using service code parts assembly lists. Apply part credits to the work order for recording warranty returns. Easily adjust on hand parts record either individually or in batch entry. Maintain detailed history of parts adjustments made. Manually assemble a list of parts that can be used in place of the selected part. Easy to use valuable reference when selected part is not currently in inventory. Saves time in eliminating the need to order part and waiting for delivery before completing work on vehicle/equipment. Used in determining warranty recovery when replacing with a cross referenced part. A detailed and organized process to conduct and document a periodic Physical Inventory including count sheets and reports to ensure accurate results. Ability to select a sorting order or filter count sheets to show a subset of parts. Enter physical count into system. Generate report to list parts not counted. Produce Part Variance Report showing a list of the parts counted quantity compared to the current on hand parts quantity. Post counts to inventory to update the on hand records. Request transfer of parts from one inventory location to another. Automatically adjusts inventories during transfer process. Record history of completed transfers. Manager approval can be enforced for site security. Read the related FleetSoft news article: How Fleetsoft can save 18% - 20% on Inventory Carrying Costs.